Although I tried a number of times to “correct” the way the words were running through my thoughts, the message remained the same. So I prayed to understand why and for what purpose I kept hearing these words in this manner. 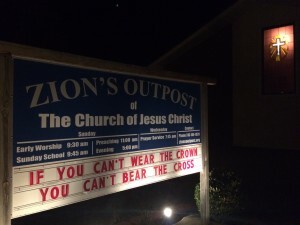 The message soon became clear: Wear the crown of the victory Jesus Christ has given us so we might bear the cross presented to us in this life. In practical terms, I understood that the Lord was reminding me that He does not expect us to face the trials of this world alone and without Him. Rather, He is calling us to receive and put on His Spirit and thereby gain the victory to overcome this world through faith in Him. In the words of the Apostle Paul, we are to put on our Lord Jesus Christ, who is that Spirit he spoke of, and thereby stand against the evil of each day. With these and other scriptures coming to mind as the tune and refrain of the song persisted in my thoughts, I started to understand how this was indeed a word the Lord had given to us today. Upon entering the church office earlier today, it was further impressed upon me to place these words – the ones which had been so persistent in my thoughts – on the church sign in front of the building (pictured above). This I understood I was to do in accordance with the admonition given by the Apostle Paul: Let the word of Christ dwell in you richly in all wisdom. And as we are also to teach and admonish one another with psalms and hymns and spiritual songs, I was led to share the meaning of the message I had received with the rest of the congregation. So, as a part of the offertory portion of our worship together I briefly explained the meaning of the words on the church sign. Through these and other verses of scripture, I had eventually come to understand how the Lord was intent on strengthening us to face the crosses we are called to bear. I also understood that He was calling me to encourage others to put on the crown of victory Jesus has gained for us on the cross of His sufferings, and we are to do so by putting Jesus Christ on as our King, as our crown. In this way we able to stand in the power of His might and strength. How do we put on the Lord Jesus? In His own words, Jesus taught that we are to be grafted into Him as a branch is grafted into a vine. If we fail to be grafted in Him after this manner, in His words, we can do nothing. By being grafted into Christ, we become one with Him. Thus, in the words of Paul, Jesus becomes our life, the source and strength of all we do. As Lord and King, He is the crown of victory. Therefore, without Jesus Christ there is no victory in our lives. With Jesus Christ, on the other hand, we can do all things through Him (by His strength). As our Savior, Jesus is the helmet of our salvation. As the Lord our Righteousness, Jesus is the robe of righteousness He gives us to wear. Briefly comprehended, Jesus Christ is our victory. He is the crown we are to put on so He may be exalted as our everlasting King. By living in the victory He has gained for us, we are able to live victorious lives in whatever circumstance or difficult place we may be in. Remember, also that the victory we are called to live in while in this world is but a shadow or pattern of that which is to come in eternity. The gift of God’s Spirit is, in the words of the Apostle Paul, the earnest of our inheritance in the kingdom of God. For while Paul lived in the victory Jesus Christ and gained for him, Paul nonetheless looked forward to a crown of righteousness that he would receive following this life. Simply stated, Paul lived in Jesus Christ though the hope of glory, which is Christ in us. Let us, therefore, put on Christ, who is the crown of our victory in this life (given us by faith) so we may endure to the end, as did Paul, and win an eternal crown of righteousness.